This table was never intended to be furniture but simply a prototype frame for developing proportions for a final design. As it turned out the poplar frame was nicely-proportioned and sturdy so I decided to add a cherry top and drawer front. The result was rather pleasing and lead me to make my five-drawer chest to go along with it. The proportions of this table are quite exaggerated in the thin top with long overhang and highly tapered legs. There was no compromise in the strength, despite the appearance since it survived my wiggle test which consists of sitting on the table and wiggling my full body weight around on it. If it doesn't collapse or rack then it is deemed stout enough for service. 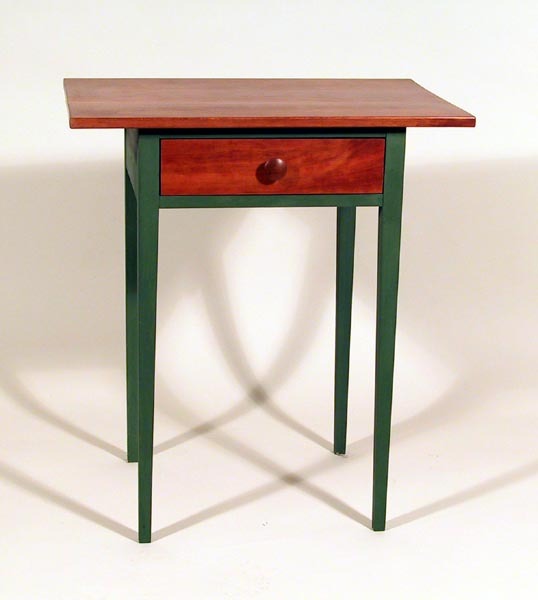 Finish is lexington green milk paint on the poplar and tung oil and wax on the cherry. Size in inches: 24 X 16 X 27.